I have been looking a fast, intuitive editor for my Windows laptop. Now I stopped looking. 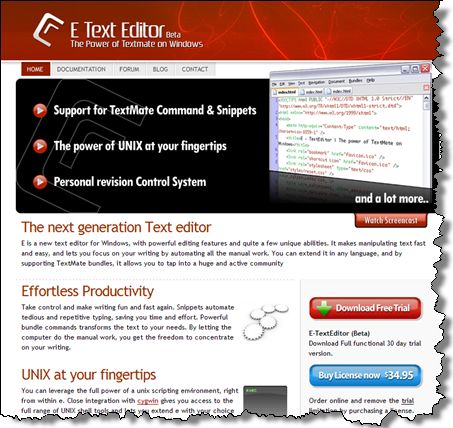 E-texteditor for windows is very intuitive and easy to use. I highly recommend watching the screencast (a short tour of some of the best features). Although it’s still in beta, it seems so much better than the alternatives. In HTML mode there is a shortcut “doctype [tab]”, but there is no shortcut for creating the rest of the HTML document. It’s probably easy to add (but i’m not into doing it yet). Besides, I think an addition like this would be a benefit to everybody, so it should be included in the general bundle. In Ruby files, when looking on Ruby on Rails, it defaults the files to Ruby (because they are and they end in .rb). However, there is a lot of functionality with regards to Rails, so it would actually work better, if .rb defaulted to Ruby. Here is a workaround to add .rb files to Rails syntax. I also added a bug report “Block selection should work without the mouse” (guess I’m a usability geek). The simple cheatsheet for E-texteditor at errtheblog is worth checking out, although it contains only the general shortcuts and not the Rails specific ones. Via: RubyInside. The bundles that Jesper mentions are actually taken from TextMate. Most Ruby on Rails hacking takes places on this text editor, which unfortunately is only developed for OS X (mac). The creator of E-Texteditor of cause asked the creator of TextMate for permission, if he could use the same bundles (which by the way is open source). The development of E-Texteditor is very fast. As far as I know bugs are dealt with rapidly and new patches released sometimes over night – which is why this new text editor has such a big following. The main reason why E-Texteditor was created, was actually not to create a text editor, but to create a version control system for documents. It just evolved into a text editor by chance. So E-Texteditor now actually has build in revision control!